One of the most fun ways to get in shape came in the form of a clever fitness app disguised as a game called Zombies, Run! 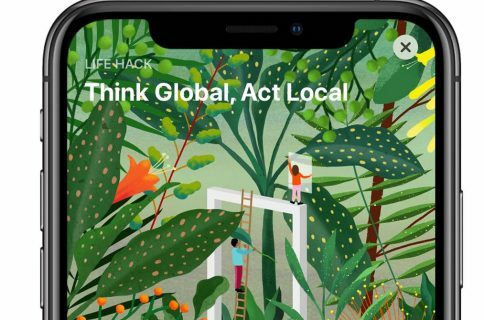 With it, users would follow a story that involved saving peoples lives and escaping brain eaters by sprinting and jogging while the app was running in the background. The app features a top-down view of a map that shows you the neighborhood, park, or other area that you are virtually walking through. 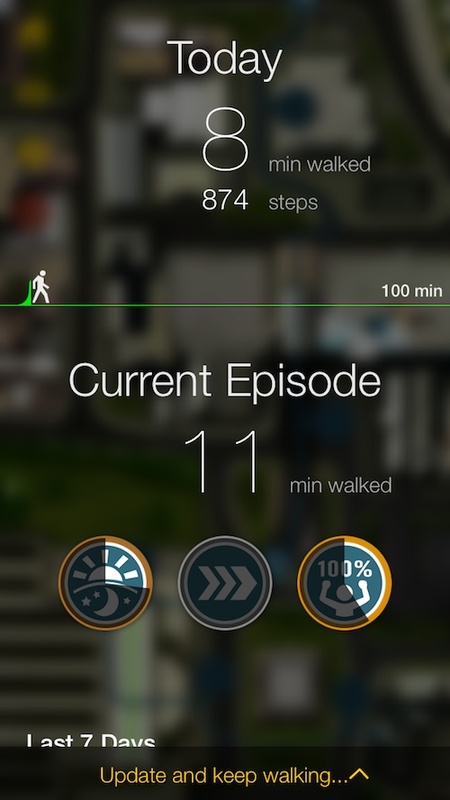 As you take steps in real life, your iPhone tracks your movement and updates your progress in the game. Where you are based and how long you have walked for is displayed on the map with the various key points listed in front of you. 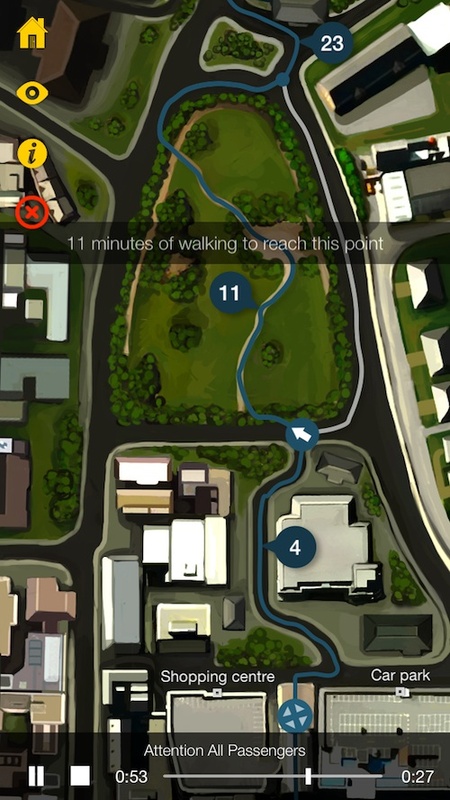 Tap on a number on the map to see how many minutes you must walk in order to unlock that content. If you have already unlocked the content, you will see an audio icon instead. There are also hidden recordings to scan for as you walk. New landscapes to scan will appear as you approach a specific area. On some sections of the map, you can change your route. This doesn’t affect how long you must walk for, but it can provide additional content that you wouldn’t have seen if you hadn’t gone a different route in the game. In addition to different maps, the app features a small bit of text that explains the game’s rules and offers a short tutorial. You can also see your game’s progress so far. The app will track how many minutes you’ve walked, how many steps you’ve taken, and the achievements you’ve unlocked. 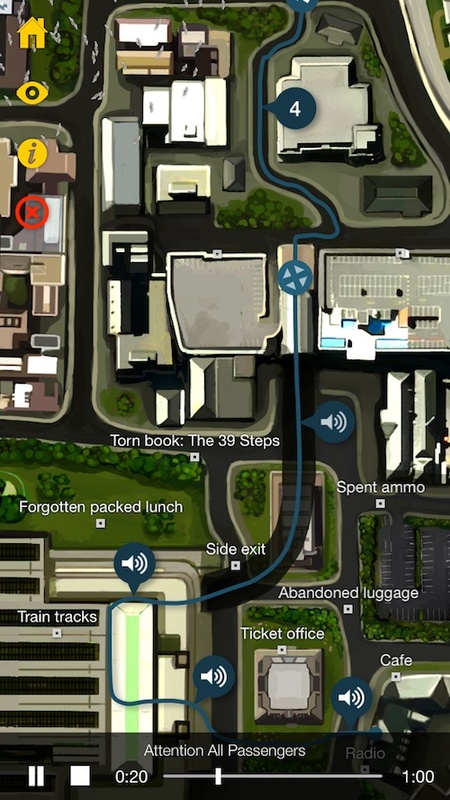 Instead of running for your life, this app lets you walk your way through the story’s plot. You don’t have to be in exercise mode to unlock the mysteries. Just open the app, turn on Background App Refresh, and keep your iPhone on you at all times. It will track your movement, including walking on a treadmill, and progress the game accordingly. While The Walk runs in the background, it keeps track of your movement through GPS and location tracking through local Wi-Fi and cell towers. It is designed with walking as the main exercise, so feel free to keep it running all day to see just how many steps you take in a day. The game’s story is based on a spy thriller adventure where you, as the protagonist, have been mistaken for someone else and given a package that a group of terrorists are after. Because the train you were supposed to be on has been blown to bits, you must walk to your destination. To find out what happens next, get moving. Instead of teasing you with stars and badges for successfully exercising, this app rewards you with more of the story. It is a great motivator. On the map in the episode you are currently on, you will see a path designated by a blue line. On that line are a series of circles with numbers inside of them. Each of the circles represents a new audio clip that involves the story. To listen to a new clip, tap the audio icon that appears after you have unlocked it. You can also scan the map for additional content and audio. When the app is open, small rectangles will appear. Tap one to see what it represents. If there is any additional data, it will be automatically added to your inventory. Players also receive points for completing tasks. For example, completing an entire episode in one day or finishing an episode without being inactive for more than three hours. There are 65 episodes with 800 minutes of audio. The amount of time it takes you to walk to the end of the story should last about three months of daily activity. That should get you to shed some of those holiday pounds. I have not had much time with this game and haven’t even made it to the end of the first episode (obviously, I need to walk more). However, I can tell from the content that I’ve unlocked that this is going to be a very interesting story. It has already motivated me to take more steps in order to find out what happens next. Don’t forget to turn on Background App Refresh or this game will not work. Having to run the app in the background is necessary for the app to track your movement, but I am not a fan of the iOS 7 feature at all. 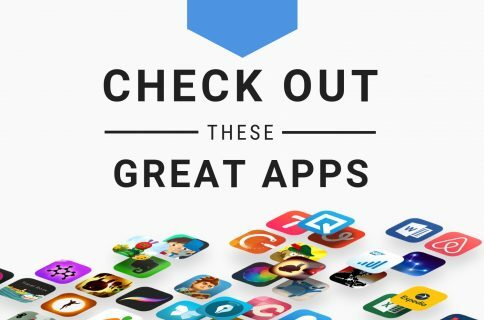 I had Background App Refresh turned off until testing this app. If you have an iPhone 5s, the app uses the M7 to count your steps even more accurately and while taking sucking less battery. The Walk is regularly priced at $4.99, but is on sale for $3.99 to celebrate its launch. It is a little high in price. I’m used to fitness apps ranging from $0.99 to $2.99. However, the uniqueness of this app/game is enticing enough to make the $3.99 price tag worth it. The app isn’t going to turn you into a fitness star. It is meant for people on a more low-impact exercise routine. You will be unlocking new content, even if you never make a conscious effort to take a walk. It will track all of your movement. Even walking to the bathroom and back will count toward your progress. If you are not big on running, but could use a little motivation for getting off the couch, this app might do the trick. Download it in the App Store today. Zombies, Run! is the same type of app, but you run and it features zombies. Couch to 5K is a great app for beginners looking for training to start jogging.